Rest your tired head on your arm without looking lazy! 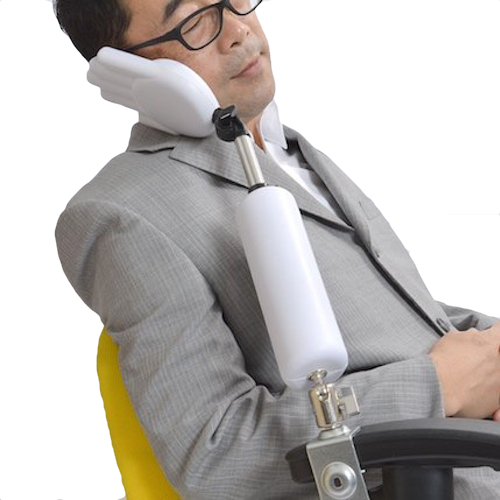 The Chin Rest Arm by Thanko is a fun office gadget for making your work day more comfortable. The clamp can be attached to a desk or table (or chair arm), and the hand and arm sections can be adjusted to a range of positions. The soft urethane materials cushion your chin or cheek, so you can covertly get some sleep at your desk all while you appear to be looking at your screen. The gadget can help stop you slouching at your desk but also offers the benefits of a regular pillow, since the "arm" section is also cushioned. And when all else fails, the Chin Rest Arm always means your high-fives in the office are never left hanging.